A photographer once remarked that to make a good picture, you must go where the pictures are - or something to that effect. I thought it would be fun to share some photographs I have made within a few hundred feet of my house. Sometimes you just can’t get out. The more I thought about it, the more I realized that I have made quite a few photographs where I didn’t need to go very far at all. So, here are some of my favorite photographs that I have made very close to - or even inside - my home. There are pictures wherever you are. Prairie dogs are viewed as nuisance animals by some, but they can be fascinating to watch. This is one of my personal favorites because this scene is so relatable to people - to parents. Two little ones cautiously survey the landscape. Prairie dogs are born blind and hairless, and do not emerge from the burrow until about six weeks old. Prairie dogs have a complex language and sometimes funny habits. One of the habits is standing up and stretching their arms skyward, while making a sort of chirping noise. Some say this is a warning, some a greeting. Maybe it’s just an exclamation of a beautiful day. Prairie dogs are very social animals and engage in PDA - perhaps even more often when they are being watched. Being close-knit is a good thing for this community of animals. 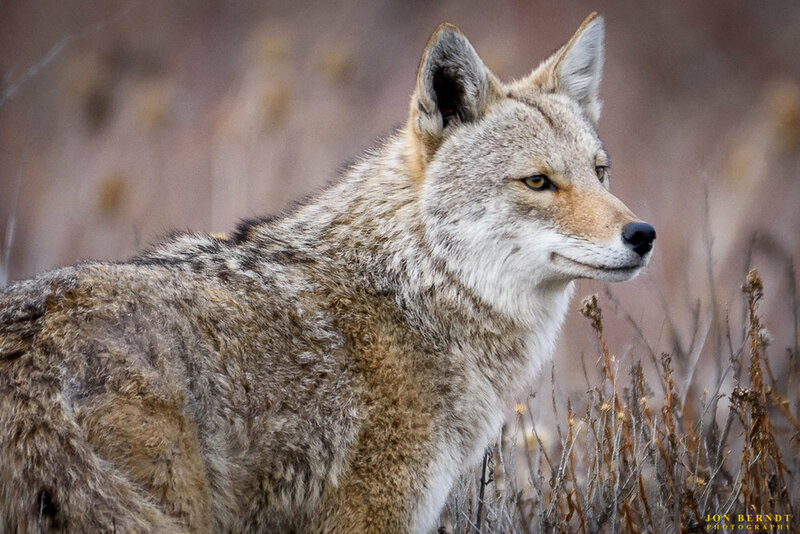 It takes a village to stay safe from the coyotes, falcons, eagles, and owls that are present in the area. There are many black-tailed prairie dogs in the open space behind my house. Photographing prairie dogs is not like shooting squirrels. Prairie dogs interact with each other in what can seemingly be very human ways. When the young ones start to emerge from their burrows - that’s when the best photographs can be made. I expect to spend more time next spring watching them and recording their antics. Move the cursor over a photograph for a description. In winter the frozen creek serves as a less exposed passage for coyotes - I have seen them often traveling this way. I made this photograph with a long telephoto lens and had hoped I would not be noticed. But, no such luck! Whatever it was that this coyote saw, I didn’t see it. When in Yellowstone a few years ago - in Hayden Valley one morning, specifically - I was photographing the Yellowstone River in the dawn light. There was a guy standing next to me at the top of a hill and at one moment he pointed behind me. I turned around and saw a very sad looking coyote cautiously approaching me, then stopping. It looked like he was sick, and after thinking about it later I think he might have had mange. This coyote near my house, however, looked very healthy to me - good weight, thick coat. There’s sure plenty to eat in the area for coyotes. 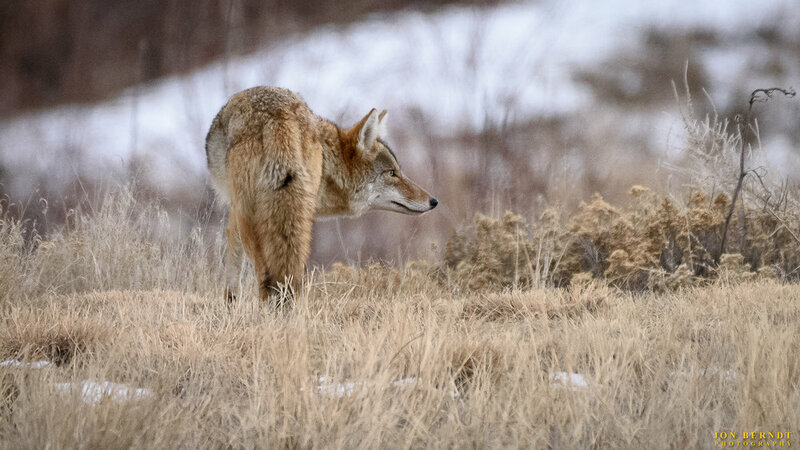 The nearby open space as mentioned above serves as a wildlife corridor, and with many prairie dogs, mice, pets, and other animals, coyotes are seen often. With a long telephoto lens it’s not too hard to get a close-in shot. The trick is to not disturb the coyote. Occasionally, I’ve seen a pair together. Sometimes at night one can hear several coyotes making a racket near the prairie dog burrows. A flashlight shined in the direction of the prairie dog burrows often shows many pairs of eyes. There are bald eagles all around the front range, but I had never seen one up close until this sighting just before Christmas, 2018. I watched this one for a while waiting for him to leap off the tree. The nearby prairie dogs seemed nervous. There are blad eagles all around the front range, but I had never seen one up close until this sighting just before Christmas, 2018. I watched this one for a while waiting for him to leap off the tree. The nearby prairie dogs seemed nervous. A red tailed hawk circles over the open space. Unlike the bald eagle that was recently sighted in this area, this red tailed hawk seems to be here as a “regular”. One day while out and about with my camera I stopped to look around the trees for an interesting looking bird. To my shock and amazement I saw this juvenile great horned owl just hanging out. Next to the juvenile great horned owl I photographed was this adult, that was less obvious. Herons and egrets both frequent the creek in the open space near my house. This one seemed to have it’s eyes on something. Hawks are fairly common in the area. And for years after I moved here I heard owls at night. But it was only last year that I stumbled upon a couple of Great Horned Owls one day, and just before Christmas last year that I saw my first Bald Eagle in the open space. After a snowfall one winter morning I woke up to see this tree beautifully coated in frosty snow, with a fog behind it at sunrise. I got outside pretty quickly with my camera to capture this. The birds at top are redwinged blackbirds. The view from their perch must have been pretty nice. This is a large rock that some believe was blasted off of the Earth long, long, ago. You can see this bright, fascinating, object by going outside on a cloudless night. I shot this through some light clouds one evening. The Lockheed Neptune P2V was formerly a maritime patrol and anti-submarine warfare aircraft introduced just after World War II ended. This aircraft was converted and operated as an aerial fire fighting aircraft by Neptune Aviation, but in 2017 these older aircraft were retired and sent to museums. This aircraft is pictured flying over Broomfield, Colorado, after having just taken off from Rocky Mountain Metro Airport. The Sun sets over the Rocky Mountains as seen from Big Dry Creek open space in Westminster, Colorado. Here are a few photographs I’ve made from outside near my house (but which don’t fall into the other categories). Fresh snowfall can bring several great opportunities, depending on the kind of snowfall (big flakes or little flakes, near freezing or much colder, foggy conditions or clear skies …). 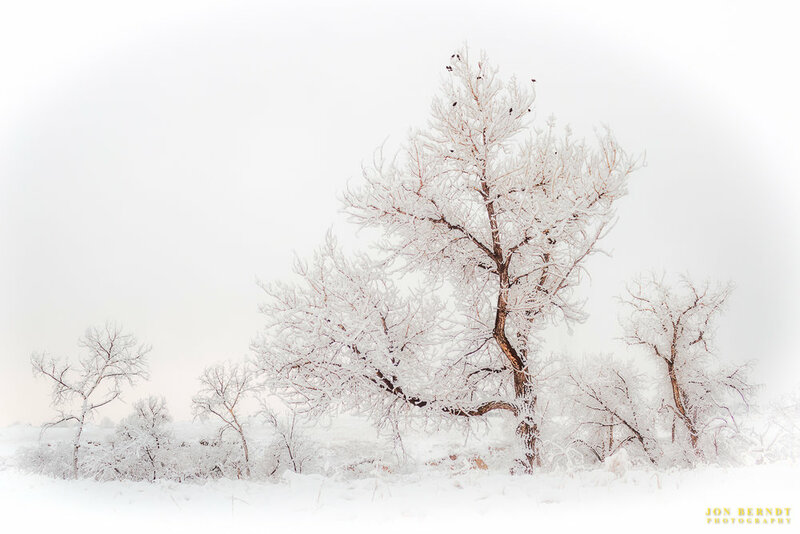 “Frosted Foliage” is one of my favorite photographs, and also a favorite of visitors to The Walnut Gallery on First Friday Art Walks. I had printed one of these on metallic paper and framed it in a custom frame that I built out of birds-eye maple. It was glazed with Tru-Vue Museum Glass It was a beautiful piece and sold quickly. The sky holds some photographic challenges as well. 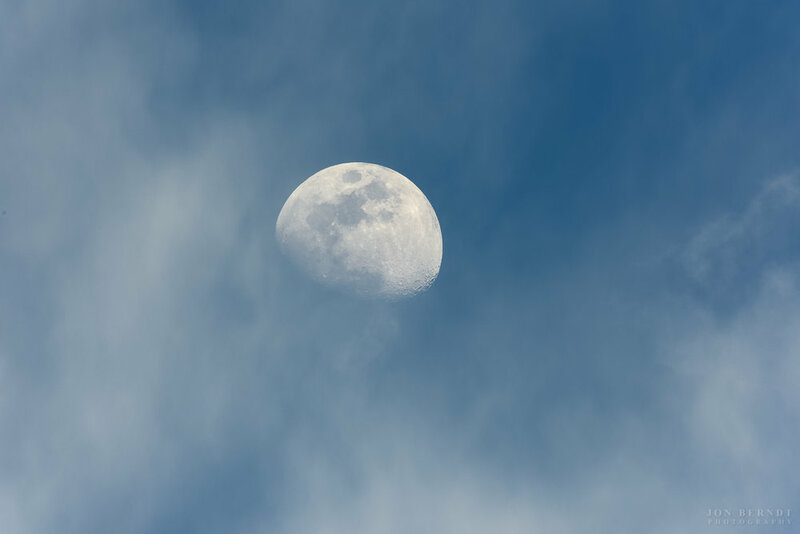 The Moon is a great target when there is something unique going on, such as an eclipse, or when clouds are present to give scale. 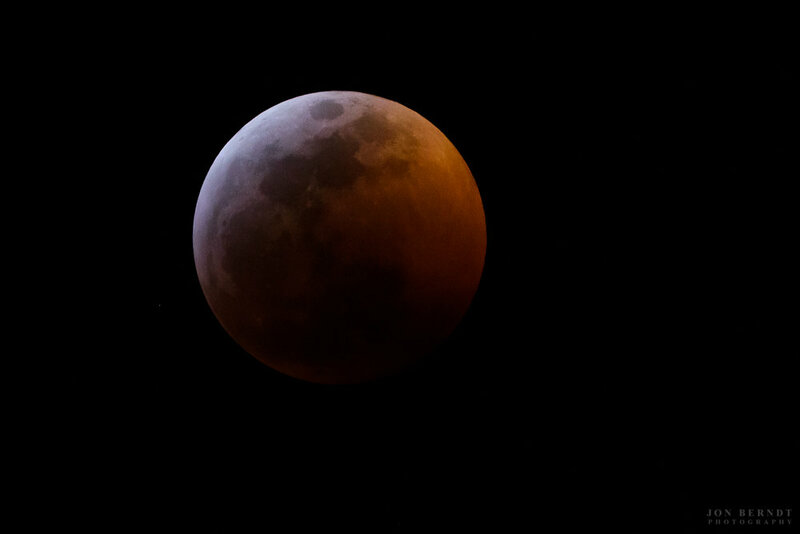 The hyped-up “Super Blood Moon Eclipse” of January 2019 was a captivating sight throughout the night. Since I live near an airport, occasionally I get some interesting aircraft flying overhead. Sometimes old warbirds. Sometimes firefighting aircraft. I have peonies in my garden and these spectacular flowers make great photographic subjects in spring. Especially after a rainstorm. This Firewheel (aka Indian Blanket) was seen in my garden. Upon closer inspection I found a Hunts Bumble Bee suspended from the center. As it was colder out the bee wasn’t moving too fast. I had time to grab my camera and make this shot. Another rainstorm, another photo opportunity in spring. This time in the front yard! Miniature pink roses, one blooming, one yet to bloom, in the back yard garden. A Tiger Lily in the front yard garden. 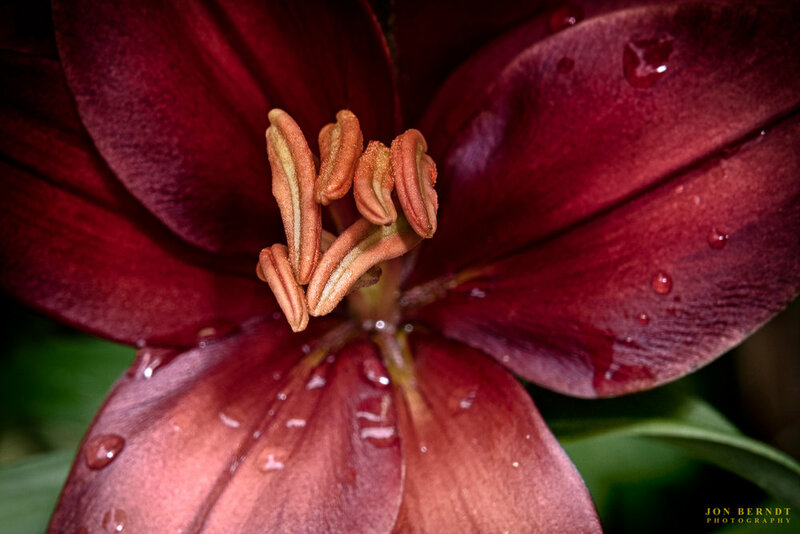 Peonies, irises, roses, firewheels, tulips, and lilies grow in my garden and sometimes offer some great opportunities for photography. I think that stargazer lilies are one of the most striking flowers one can have in their home. A few years ago I got an idea where I wanted to try and recreate the feel of an old classic still life painting of a floral arrangement. I found a great vase and repainted it, set up the lights and scene and paid a visit to a local florist who had everything I needed. This photograph is comprised of a few individual photographs combimed to give great detail. This photograph could be printed very large. I got an idea for a photograph I intend to make some day. This wasn’t quite what I was intending, but I like it nonetheless. This is a fresh peony from my garden, over dried rose petals of different colors from various roses I have given or received. There are over 25,000 varieties of orchids - some of which have incredibly unique shapes. These, by comparison, are fairly “ordinary”, yet beautiful, too. My cat gets up on my desk every afternoon as part of her routine and sits near one of my computers. The fan blows warm air and she likes to keep warm there. There’s something calming about a purring cat on your desk. I was preparing for a portrait shoot when Khaleesi jumped up on the chair and crawled under the gold cloth. As I had the lights already set up I could not have asked for a better opportunity. I’ve experimented on occasion with different portrait lighting techniques. Sometimes I win, sometimes I lose. I liked this one. As part of a photography challenge that involved light painting I had fun with this wine glass and a red laser pointer. Sometimes I get an idea for a photograph that needs to be made in my studio. Still life photographs of flowers are one of those things. Portraits of people are another. And then there are opportunity shots of my cat, Khaleesi.